San Diego, California - Local law enforcement and health officials are warning the public about a spate of deaths in beach communities connected to cocaine laced with the highly-potent and often deadly drug fentanyl. This past weekend three people died, and two others overdosed but survived, related to the ingestion of what initial toxicology results show was cocaine laced with fentanyl. The deaths occurred in the areas of Pacific Beach and Ocean Beach; the victims ranged in age from 30 to 47-years old. Authorities are not able to say publicly where the drugs may have been distributed or obtained. Various law enforcement agencies are investigating and no arrests have been made. In the meantime, investigators believe more of the dangerous drug combination may be being sold by dealers. A Drug Enforcement Administration-led task force is investigating the recent deaths and said the danger of fentanyl-laced drugs goes beyond cocaine. 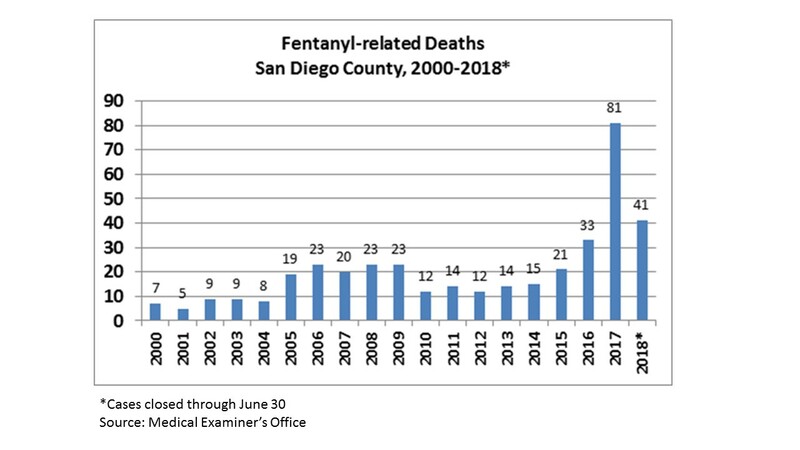 Deaths specifically from fentanyl or fentanyl in combination with other drugs in San Diego County are spiking. Eighty-one fatal overdoses were reported last year, more than double the number in 2016. Fentanyl, a synthetic opioid, is 50 to 100 times more potent than morphine even in tiny doses. As little as two milligrams of fentanyl is a fatal dose for most people. Fentanyl can be up to 50 times more potent than heroin, and overdoses may require additional Naloxone to reverse. Naloxone is a medication that reverses overdose from opioids. Additional doses of Naloxone are sometimes needed to reverse fentanyl overdoses due to the potency of the drug. The County offers several treatment programs across the region. People seeking help should call the San Diego County Access and Crisis Line 888-724-7240 or 2-1-1 San Diego. Both of these resources are available 24 hours a day, seven days a week.